Wedding Favor Containers are traditionally filled with candy or chocolates, but these small stylish boxes can be transformed into custom wedding favor packaging easily! 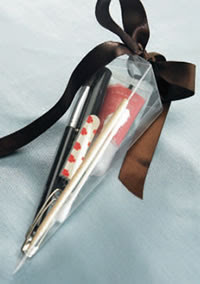 Cone wedding favor boxes are a great fit for wine stoppers, but can easily accommodate other wedding favor items. You can even create a wedding day emergency kit for your bridesmaids by filling them with safety pins, a nail file, lip gloss, and more. Think of the container as more than just wrapping for your favor. Combine the box and favor together with fillers, dazzlers, and ribbon for a truly unique presentation. For a beach themed wedding, fill your cones partially with colored sand and a special note for custom "message in a bottle" wedding favors. Fun miniature galvanized cans and pails work well as favor containers too! Mini metal pails can be stuffed with lollipops and decorated with flowers or dazzlers. Personalize them with custom ribbon or favors tags for an adorable wedding favor. Visit http://www.WhereBridesGo.com for hundreds on unique wedding favors and beautiful wedding favor boxes, plus all the accessories to add that extra personal touch!